The Cole Sofa Sectional steps up with contemporary flair to create an irresistible collection of seating in your living room. 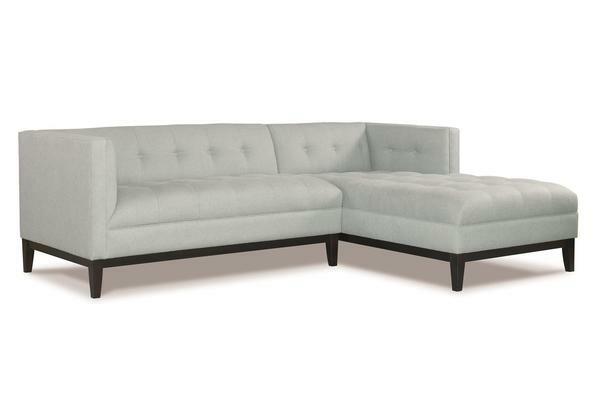 Cole's squared off shape creates a tremendous contemporary form, combining a loveseat and chaise lounge raised on modest legs resulting in an exceptional cozy corner. Cole is built to enhance daily living, with seating that's pure comfort. Sofa cushions are thick and plump, while a single line of button back detailing adds to the design. View Precedent quality in our featured videos shot in the DutchCraters showroom in Sarasota, Florida. Witness the commitment to producing fine furniture that will last for years and beyond. Precedent guarantees their frames for life to the original buyer and their cushions for two years. Their use of certified lumber and recycled steel adds an eco friendly vibe to their furniture. Stay neutral or add the pop of color you're wishing for with your new sectional. We offer custom fabric or genuine leather to showcase in your living room. All of our custom fabrics perform to the highest standards. A great option for families with children is our Performance Plus Fabric that features Crypton technology. This makes Performance Plus fabrics ultra resistant to stain, odor and wear. They also clean easily when spills occur, with liquids beading and rolling off the fabric. If you have questions about your new sectional, we invite you to get in touch with a Furniture Specialist. They are happy to assist you, and want to make sure you have a quality shopping experience to match your quality furniture. Our team can be reached via phone or email and we look forward to speaking with you.